Flows from a pipe, I am told this spring comes from a deep aquifer, it is very popular and always has a line of cars waiting to fill up bottles. From I-94, go South on WI-67 (Summit road) then head East on Parry Road (near the Dousman watertower), Spring is on the right. From Hy 67 head East on Parry Rd appx 3/4 mile. Spring will be on left (north side) of Parry Rd. I was doing some research on the water quality. Someone had it tested in 2011. While a few years old, looks fine from a heavy metal perspective. I can’t imagine it’s changed much since then: http://scuppernongspringsnaturetrail.com/tag/parry-road-spring/ I plan on having the water tested this spring and will post the results. Has this been tested recently? Went there yesterday. Water tastes great. It really is a barrel with a metal pipe on the side of the road. If you are coming towards Dousman from the south, 67N, then Parry road is the last street (right turn only) before the Dousman water tower. Its a windy road. If you get to a T where Parry road ends, you have gone too far, but not by much. Just turn around. If you turn around, then the spring/well will be on your right. If you don’t miss it, it will be on your left. I noticed it is not flowing as fast as it used to and there is water bubbling up from the ground on the other side of the “barrel”. Has anyone else noticed this? I am not sure how the pipe is attached to the spring itself, but wondering if there is a leak somewhere? Someone who knows more about how springs are tapped would be great! Thanks. Has anyone noticed that it seems to be flowing slower this year? There is also water coming out of the ground on the other side of “barrel” from the spout. Thanks. I am planning on getting this water tested at a facility in Mequon http://www.waterdiagnostics.net/, the state offers testing but it is expensive and has a long wait. I can only afford to test 2 contaminates; lead, arsenic but I would encourage and ask anyone else who can add to this list to please do so. I will add my results as soon as they come in. I would expect 2 weeks. does anyone know the fluoride content in the spring? i’m interested to know in particular, the levels of lead and the levels of arsenic. these are 2 main concerns for me. I went today, great water. TDS was 289 which was better than Hygeia Spring in Big Bend which tested in the 450’s and the Pryor Avenue Iron Well in Bayview which read around 350. RYNhales…. Thanks for the posting as I have been using water from here for the past few years for drinking and brewing purposes as well…. without issue. I have met many people at this well. Some who have been drinking it for years (+20) and offered a little history about it as well as others who were there for the first time. The first timers would always ask if the water has ever been tested and my thoughts. So thanks again for the results…. BTW the white stuff left behind after boiling is called temporary hardness, it is the Carbonate & Bicarbonate that precipitates out of solution by boiling… The calciam and/or magnesium ions form into solids (calcium carbonate and magnesium carbonate). lead and arsenic level please. what local lab for water testing. I tasted this water for the first time today and it’s delicious! I will be back! I have been going to the spring for over 35 years. Wonderful and refreshing. I use this water for all canning, fermenting, and home brewing. Municipal water, with chlorine, kills off some strains of the good bacteria when you are fermenting anything – in your gut too. If you are on a municipal water system drink from your tap then drink from the spring…its like store bought tomatoes compared to garden grown. I have never boiled the water before drinking; there is no need. Straight from the ground to you with only a couple inches of pipe in between. I would also like to see a full analysis to see all the minerals in the water. I plan on visiting this spring later today. I would be curious to see the full write up on the mineral content, TDS, Suspended solids, DOC, etc. I’m going to assume that the water will be similar to Waukesha’s water, and contain some degree of Radium (Ra) <— but that would entirely depend on the lithology of the aquifer (which I have not researched). Chloroform, an additive to municipal drinking water used to protect against Typhoid, is slightly carcinogenic (Gold et al, 1992) and should be absent from this spring 🙂 If any one finds out more info. on this well please post. It’s on the north side of the road, you’ll see a dirt area on both sides of the road to park. Delicious cool water! no smell, no aftertaste. I’ll be going back! My husband and I have been getting water from this spring for 6 years. We took a sample into a private water testing facility in Brookfield, paid $25 for the test. There were no traces of heavy metals or any contaminents. Totally safe spring water! The white film is probably because it has a high lime content, which is a natural mineral! Mfeltz3 – Do you still have a copy of the water report? should we boil the water first before we drink it? This water has a somewhat high tds – around 350 if I remember right – and it does leave a film – I haven't been able to find any low tds springs in southern WI. My feeling is that this water is ok occassionally, and certainly a lot of people in the area drink it, but I prefer not to drink it long term. What do you mean by “tds” and what is it? Hi, what spring does she get her water from? I boiled this water and there was a white film left in the pot. Does this mean the water is not any good? I heard this water was not good…..in fact as recently as yesterday. Hi Debbie, can you tell us what you heard about this water? What’s not good about it? Do they test this water? I was told that there is no testing done. Please let me know, as we do get our water from there. A neighbor told us about this. She gets het water from another spring. Thanks. just keep drivign…if you turn onto parry left off of 67, its on the left side. its right after a curve, and before a curve! lol not that that helps any! you cant miss it! its also called “rebeccas well” back from the 1800's–i grew up on this water…my formula was even made with it 16 years ago when i was a baby:) best water ever! hmmm – I haven't been back there since it snowed – perhaps it is harder to see? I would say it's a couple of miles – Parry road ends shortly after the spring if you are heading East. Went to try and find the spring today, but couldn't find it. How far is it once you turn onto Parry Road? According to Mapquest, it's about .3 miles but we didn't see it. Will have to go back and search some more. Anyone in the Chicago area, wanna carpool up next time. I'm on twitter and facebook. Drove here from Chicago yesterday, totally worth the trip! The spout is high enough to be able to put 5-gallon jugs on the ground and just let them fill up. Drove from Chicago up to this spring. Got in before the cars started lining up. 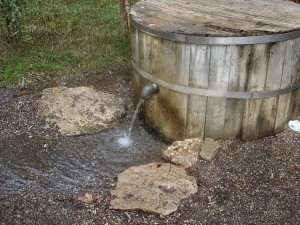 Easy to find and great fresh cold spring water. With these directions, the spring is on the Left, not the Right, Apologies!